The boss of the UK's busiest port has warned people travelling to the European mainland in the run-up to Brexit to be prepared for disruption. Dover Harbour Board chief executive Doug Bannister told the BBC families should allow sufficient time and have snacks and water in their cars. "If it takes an additional two minutes to process a vehicle, that could lead to a 17-mile queue," he said. Dover handles 17% of the UK's goods trade, worth more than £120bn. Every year, 2.3 million tourist vehicles pass through the port. The UK is scheduled to leave the EU on 29 March, although there is a possibility that the deadline will be extended. The government said last year that Dover and other Channel ports could face disruption for up to six months in the event of a no-deal Brexit. Bookings for the rest of this month have not been affected by the unfolding Brexit crisis and port officials are expecting to deal with the same number of passengers and lorries. "I can appreciate the concerns people have," Mr Bannister told BBC Radio 5 live's Wake Up To Money. "If anybody who is planning a trip to Dover knows exactly what's going to happen on the 29th, there are a few million people who would appreciate that knowledge." Mr Bannister added: "It is an uncertain period. I think people will be vigilant enough to take the appropriate measures. "We will absolutely do our very best to make sure information is out there in the public domain upon which people will plan their journeys." The port authority has cancelled workers' holidays, changed their rotas and brought in extra staff to cope with whatever happens. It has been working closely with the government's Border Delivery Group and its plan for Brexit will be up and running from Wednesday. The port is part of the Kent Resilience Forum, made up of the county council and local business, and has plans for various different Brexit scenarios. Dover is no stranger to traffic jams. Most recently, industrial action by French customs officers resulted in lengthy delays. 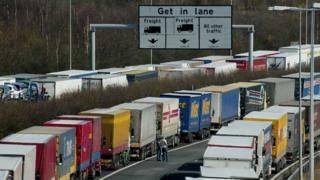 Operation Stack, where lorries queue on the M20 when there are problems on the ferries or at the Channel Tunnel, will be replaced by Operation Brock, an attempt to reduce traffic on the M20 by creating a contraflow. Mr Bannister, who started his job in January, worries that even though the port has spent time and money planning for a no-deal Brexit, it has no control over additional passport checks as passengers and freight enter from France. He is hopeful cars and lorries will be able to move through seamlessly, but says any extra scrutiny will mean there are delays. "Check the roads, check apps on traffic info and mapping apps" before setting out, he advised travellers.